Unique in its kind, the Amalfi Coast is home to steep hamlets, steep cliffs, teeming beaches, plots of vertical stairs, yellow and fragrant lemon groves, squares and caskets of art of incomparable charm, which have charmed illustrious travelers and Hollywood stars. 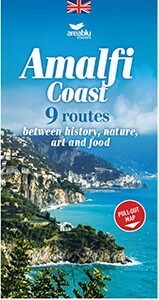 The sinuous curves of SS Amalfitana 163, the most beautiful road in the world, will take you to the most famous and less known places, UNESCO World Heritage Site. Savor typical dishes not always present in tourist menus. Enjoy the true soul of the "Divina", in its slow going, unveiled by journalists and experts of the territory, real "local ambassadors" of such beauty. Inside the guide: Secret passages, the Coast of taste, the literary Coast, the Coastal celluloid, appointments for a year, useful information, travel with Areablu, the Coast on Instagram, illustrious looks on the Coast.